but they can be used for many other recipes. This recipe makes approximately 6 BLT's. 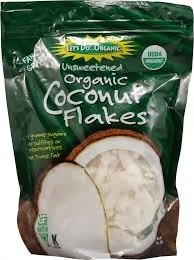 Mix all ingredients in a large mixing bowl until coconut flakes are well coated. Spread flakes on baking sheet and bake for 10 minutes. Stir and cook for 10-15 more minutes making sure they don't burn. Remove from oven and let cool to get crispy. On your choice of bread, use Vegan mayo, fresh sliced tomatoes and organic romaine lettuce. Top it off with fresh sliced avocado, if desired. & Coconut Secrets Aminos have only 115mg. at your local health food store for less than $4. It goes a long way!